A "dangerous" high diving platform used by generations of divers since the 1930s is finally being demolished. 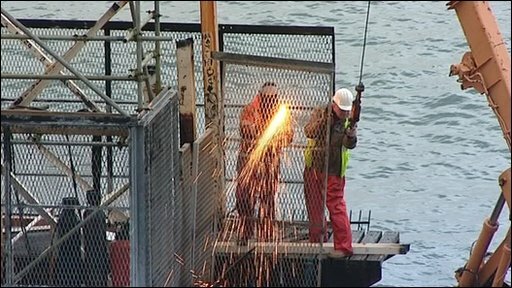 The 60ft (18m) Tinside platform on Plymouth Hoe was closed and caged in 2003, but teenagers continued to use it by climbing around the mesh cage. Plymouth City Council decided to remove the platform after a 15-year-old boy was badly injured when he fell from the platform last September. The structure is being dismantled in sections and removed by barge. 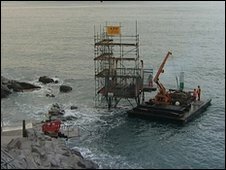 The council's decision was made following as independent assessment, which stated the diving platform either had to be fully supervised by a lifeguard with extra security or removed completely. The estimated cost of lifeguard cover and security was about £100,000 and the council said experience had shown some young people would try to get around safety measures and would still be at risk of injury. Councillor Mike Leaves said safety had to be the priority. "This was not something we wanted to do, but I don't think we have any option," he said. "I really wanted this board to be reopened, but now we have looked at all the advice from the experts, we have to take action."